SUMMARY: BOLD fMRI has, during the past decade, made a major transition from a purely research imaging technique to a viable clinical technique used primarily for presurgical planning in patients with brain tumors and other resectable brain lesions. 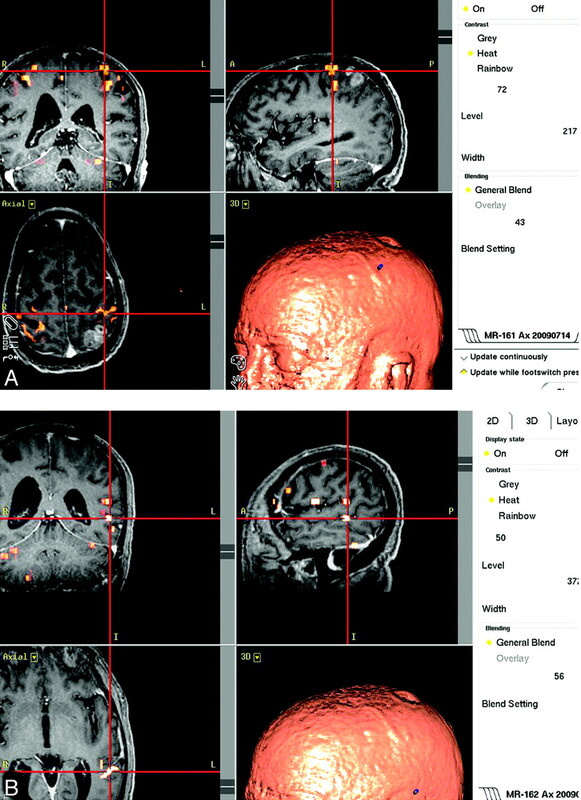 This review article briefly examines the history and evolution of clinical functional imaging, with particular emphasis on how the use of BOLD fMRI for neurosurgical planning has changed during the past 2 decades. Even more important, this article describes the many published studies during that same period that have examined the overall clinical impact that BOLD and DTI have made on surgical planning. fMRI is a physiologic imaging technique that has rapidly evolved since the early 1990s when Ogawa et al1–3 first described the BOLD principle, which was based on animal imaging studies and was considered novel. Human imaging applications arose only in 1991, when Belliveau et al4 described mapping of the human visual cortex by using fMRI. Since those early days, fMRI has burgeoned into one of the most useful research techniques in modern cognitive neuroscience, with use by a wide variety of researchers in fields as diverse as psychology, neurology, psychiatry, and linguistics. However, clinical use of fMRI is a relatively recent phenomenon, with only slightly more than a decade of collective experience. This review article examines the history and evolution of clinical functional imaging, with special emphasis on BOLD and, to a lesser extent, DTI applications in clinical brain tumor imaging, which have served as early models for the clinical translation and maturation of these imaging modalities. In addition, this article describes the clinical impact that BOLD and DTI have made on surgical planning. The ASFNR was established in 2004 to address the unique concerns relating to clinical use of functional imaging, comprising not only BOLD imaging but also DTI, perfusion imaging, MEG/magnetic source imaging, and molecular and metabolic imaging, including MR spectroscopy. As all of these physiologic imaging modalities enter mainstream clinical neuroradiology, a growing need to establish national standards for their clinical use and standardized quality control metrics has emerged. The ASFNR, by planned launch of a multicenter study that will assess the effectiveness of BOLD and DTI in surgical planning, is well-poised for this role. The steadily increasing membership of the ASFNR and successful annual meetings, such as the one conducted in late February 2009 in San Antonio, Texas, are a testament not only to the increasing popularity of these techniques but also to the growing need for incorporation of these modalities into mainstream clinical neuroradiology practice. While a description of all the research and clinical applications of these diverse physiologic and metabolic imaging modalities that are embraced by the ASFNR is clearly beyond the scope of this article, we can examine the technique that has historically served as the springboard for the birth of the ASFNR—BOLD imaging—and, to a lesser extent, the complementary role of DTI in presurgical mapping, which are the main currently accepted clinical applications of these techniques. There are broadly 3 main categories of patients who commonly undergo preoperative fMRI: 1) patients with structural brain lesions in close proximity to eloquent cortex who need preoperative functional risk assessment, 2) patients who need determination of preoperative language hemispheric lateralization (and possibly, in the future, memory lateralization), and 3) patients with epilepsy needing preoperative seizure-focus localization with electroencephalographic-correlated fMRI.5 We will focus on the first 2 categories in this article. In the early days of BOLD imaging (the 1990s), all such imaging was conducted at most centers under institutional review board−approved research protocols because no accepted clinical application existed, and much investigation into the basic principles of BOLD contrast was necessary. Because EPI was relatively new and most MR imaging scanners were operating at field strengths of 1.5T or below, with limited gradient strengths and low slew rates, BOLD imaging was relatively difficult to perform. While FDA-approved EPI sequences were developed by scanner manufacturers, the software for BOLD image analysis was not FDA-approved but was rather designed strictly for research applications. During the early era of clinical BOLD imaging, the same basic interdisciplinary approach that served as the hallmark of BOLD research applied equally to clinical examinations. Often an MR imaging physicist or 2, research assistants, image-processing personnel, a statistician, and, at some centers, a psychologist or neurologist were participants in a multidisciplinary fMRI research team along with a neuroradiologist either with or without a dedicated MR imaging technologist. The fMRI systems used had to be essentially assembled by the research team, with stimulus-presentation software and hardware, patient-monitoring equipment, and paradigm design and implementation all independently developed or purchased from different vendors. No integrated commercially available fMRI system existed, and the home grown systems were not designed to be MR imaging technologist−driven. Other studies were performed comparing preoperative language fMRI results with those of awake intraoperative CSM results. For example, Yetkin et al13 in their study of 28 patients who performed finger, lip, and tongue motor tasks in addition to silent word-generation and counting tasks, found 100% concordance between the fMRI activation sites and intraoperative stimulation sites within 20 mm and 87% concordance within 10 mm. Furthermore, Benson et al27 reported correct language lateralization by using a verb-generation task in 22 of 23 patients who also underwent either Wada testing (n = 12) or CSM (n = 11) as a reference standard. Hirsch et al,16 in their study of 125 patients and 63 controls using multiple fMRI tasks, found sensitivities for detection of the Broca area of 93% and 77% and for the Wernicke area of 100% and 91%, respectively, for the control and patient groups; they also noted overall concordance with CSM and Wada results. While memory mapping has been the subject of extensive research during the past decade, it has not yet gained widespread clinical acceptance despite the publication of 3 validation studies, which have compared preoperative memory fMRI lateralization with preoperative Wada test results and/or postoperative memory outcome.28–30 For example, Janszky et al28 in their study of 16 patients with right mesial TLE who performed the Roland hometown walking test found a high correlation (r = 0.71) between the preoperative fMRI memory lateralization and individual postoperative memory outcome following right anterior TL resection. Similarly, Richardson et al30 noted high correlations between preoperative fMRI hippocampal encoding asymmetry and postoperative memory outcome in their study of 10 patients with left TLE who underwent a verbal-encoding task. Many of these studies were fairly unsophisticated because in that era, export of postprocessed functional activation maps into neuronavigation systems was not possible and most radiology departments did not even have PACS, but were rather relying on hard copy films. Neurosurgeons using such data at most centers had access to only relatively primitive neuronavigation systems that only permitted use of 3D structural brain images; for this reason, hard copy images of BOLD results were often posted in the surgical suites for planning purposes. As PACS servers became more common around the turn of the century with the digitization of radiology departments, more impetus for electronic transfer of functional activation maps to PACS servers developed. Along with the development of PACS, we have seen a tremendous increase in computational capacity since the 1990s. In those days, much of the processing of BOLD data was extremely time-consuming due to relatively slow CPU processing capability and relatively low memory (RAM) capacity of high-end computer workstations in that era, and the data-storage needs were colossal, considering that a single clinical study could exceed 1 gigabyte of data. It was not uncommon for a single clinical fMRI study to require up to 8–12 hours of processing by using GLM approaches. A minimum of 1 terabyte of storage capacity was considered optimal in those days, which seems minute compared with the requirements of the current era. Multimodality image fusion, now the standard, was not widely available due to the inherent limitations of BOLD processing and coregistration with other functional imaging datasets. For example, coregistration with DTI maps, such as FA-weighted color directional maps or DTT, was generally not feasible because different research software packages were used for generation of the DTI maps, which were not necessarily compatible with the software used for the BOLD image analysis. Scanner vendors did not provide commercially available software for DTI processing, and only standard 3-direction diffusion encoding was available for generation of typical diffusion-weighted images and postprocessed apparent diffusion coefficient maps. Similarly, dynamic susceptibility contrast perfusion MR imaging was in its infancy as well, and commercially available software generally allowed only acquisition of time-to-peak maps and basic cerebral blood volume maps, not corrected for contrast-leakage effects or capable of providing permeability information. Even the phenomenon of neurovascular uncoupling had not yet been described, and many of the potential pitfalls of the clinical application of BOLD imaging were just being acknowledged for the first time. Furthermore, BOLD imaging has made a major transition from a research to a clinically viable imaging technique. The development of the new CPT codes for fMRI in January 2007 signifies this transition to an essential clinical tool that has elevated the surgical standard of care. From the very beginning, our neurosurgical colleagues have been primarily responsible for advocating the clinical use of this technique, and currently neurosurgeons at a growing number of academic medical centers consider the combination of BOLD and DTI to be an indispensable component of their practices. Such imaging has influenced preoperative risk assessment, intraoperative mapping strategy, and surgical trajectory. Many major improvements in the current decade of clinical functional imaging have made performance of these examinations much more streamlined and practical. Newer commercially available fully integrated FDA-approved fMRI systems are now available that offer turnkey solutions from a data-acquisition and paradigm-delivery standpoint as well as rapid and often technologist-driven streamlined processing. No institutional review board protocol is needed for use of these FDA-approved clinical systems. A variety of well-documented paradigms are available for motor, language, and visual mapping. Three-dimensional fusion of DTI and BOLD datasets and delivery of postprocessed images to PACS servers and neuronavigation systems are now possible due to software improvements. Image-processing time has been drastically reduced to ≤1 hour for BOLD processing, largely due to vastly more powerful computer workstations with faster CPUs and greater RAM. While the need for increased data-storage capacity has grown, the cost associated with incremental expansion of data-storage capability has decreased substantially. Perfusion imaging or cerebrovascular reactivity mapping is also performed at many centers along with BOLD fMRI to evaluate the potential for lesion-related neurovascular uncoupling. DTI for depiction of eloquent white matter has been as useful in clinical practice as BOLD imaging for delineation of eloquent cortex because surgical severing of these white matter tracts can produce similar postoperative neurologic deficits. Many scanner vendors now offer streamlined DTI and DTT packages, and the overall value of DTI for preoperative risk assessment is excellent.36 See Fig 1 for an example of how the combination of BOLD and DTI is used in the evaluation of a patient with a brain tumor. 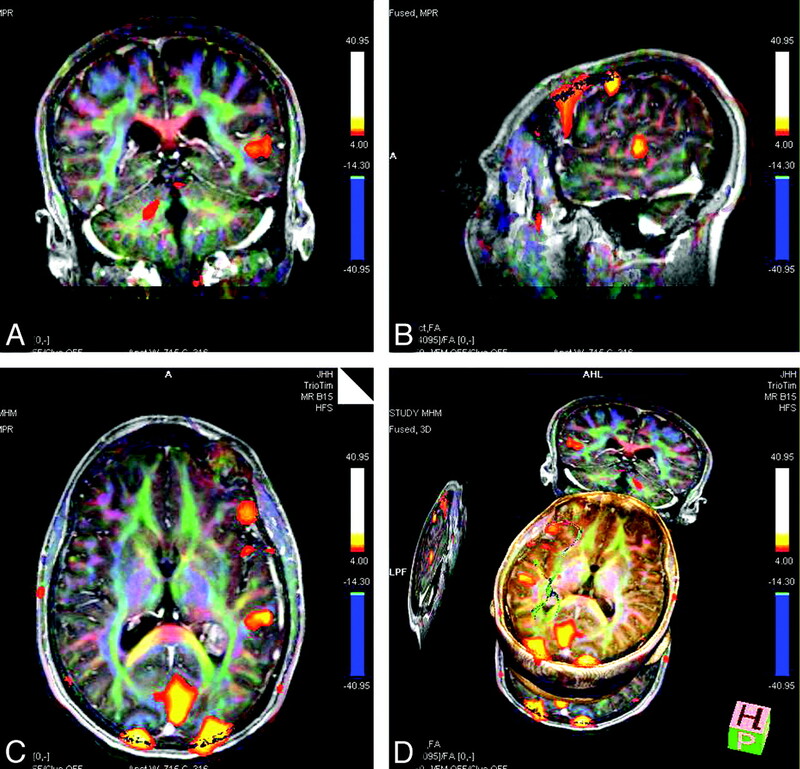 Multiplanar views of language BOLD activation overlaid on FA-weighted color directional diffusion maps superimposed on postgadolinium 3D magnetization-prepared rapid acquisition of gradient echo high-resolution anatomic images in a patient with a left trigonal intraventricular mass. The BOLD paradigm used is a silent word-generation task. Red-green-blue coding convention is used for DTI display, in which red refers to mediolateral; blue, to superoinferior; and green, to anteroposterior preferential diffusion. Note the activation of both Broca and Wernicke areas in the left hemisphere in this left-language-dominant patient. One relatively recent advance has been the ability to import digital BOLD and DTI data directly into neuronavigation systems. Some of the neuronavigation companies even offer their own BOLD and DTI processing software, including software for basic tractography. Several recent studies have shown great promise for DTI incorporation into neuronavigation systems for surgical planning,37–40 and similar studies have shown the added value of BOLD results when incorporated into neuronavigation systems.41 Each of these studies will be described briefly. See Fig 2A, -B for examples of language and motor BOLD-activation maps imported into a neuronavigation system. BOLD activation maps imported into a neuronavigation system. A, Hand motor activation from an alternating finger-tapping paradigm, with the 3D cursor placed on activation seen anterior to a left parietal lobe tumor. B, Language activation (combination of silent word-generation and rhyming tasks), with the 3D cursor on temporal lobe receptive cortical activation, in close proximity to the classic Wernicke area. Some technical pitfalls of clinical BOLD imaging have been highlighted as a result of the growing use of this technique. Foremost among these is the phenomenon of neurovascular uncoupling, which refers to the uncoupling of the regional microvascular blood flow changes from adjacent neuronal activity often seen in high-grade brain tumors with tumor angiogenesis or in arteriovenous malformations that alter local cerebral hemodynamics; many biochemical mediators of the neurovascular coupling have been implicated, such as nitrous oxide, certain neurotransmitters, etc.42–44 Cerebral vascular reactivity mapping by using carbon dioxide challenges or breath-holding, MR perfusion imaging to assess the presence of regional hyperperfusion, and complementary intraoperative mapping evaluation are methods that different centers are using in the current era to assess the validity of BOLD activation in light of this important potential limitation. The future of clinical functional imaging holds the opportunity for neuroradiologists to work more closely with neurosurgical colleagues as preoperative functional imaging becomes progressively incorporated into the evolving surgical standard of care. Challenges in a revenue-driven radiology practice model will have to be met with demonstration of the added value of functional imaging in overall patient care, and neurosurgical end-users will continue to provide this necessary impetus for development in this field. Although currently limited to major tertiary care academic centers, clinical functional imaging will likely soon make its way to private practices and smaller academic centers as vendors provide increasingly sophisticated streamlined and integrated packages. In the future, with increasing use of higher field intraoperative MR imaging systems, integration of presurgical and possibly even intraoperative functional imaging data into neuronavigation systems with effective real-time brain-shift correction may become a reality, and this will affect the future role of the functional neuroradiologist. In addition, the need to train neuroradiology fellows in functional imaging is being increasingly recognized; therefore, fellowship programs will need to provide trainees with more exposure to physiologic/functional imaging in the near future.